It is no secret knit shoes are in. 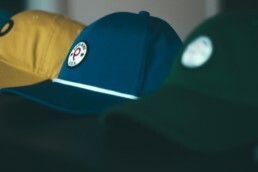 Big brands like Nike and Adidas have made billions of dollars off their popularity. Now, the trend is working its way into the game of golf. Established companies like TRUE Linkswear have brought some high-quality product to the market with a phenomenal reception from the consumer. 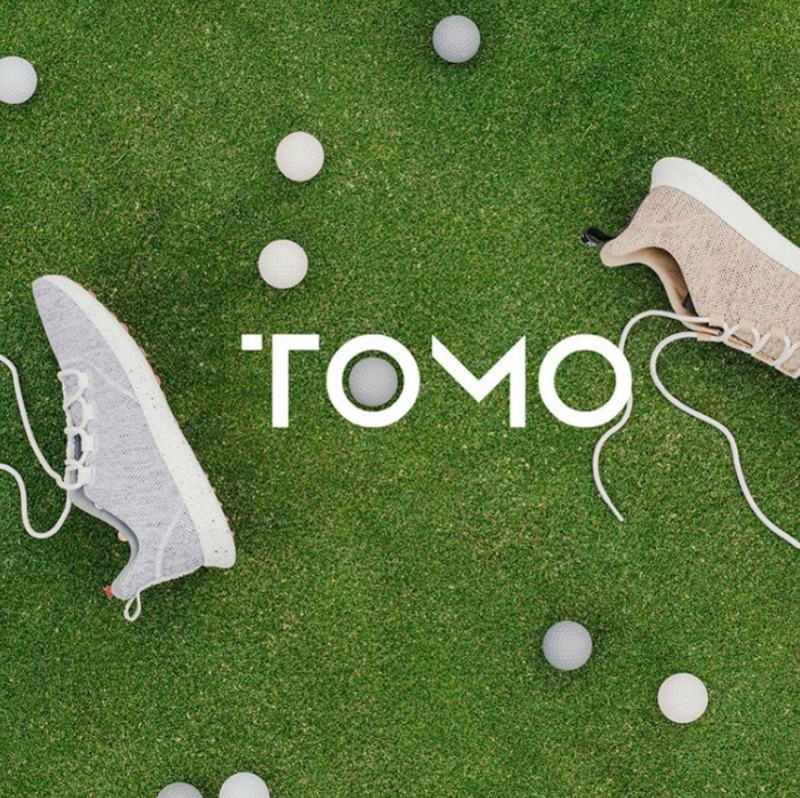 Sunny Chou, the founder of Tomo Golf, is looking to add to this movement by introducing his own twist to the golf shoe. Welcome, Sunny! Thanks for joining us. Let’s start by telling our readers about TOMO Golf. Since golf is a game for everyone, we made a shoe for everyone! We believe that you don’t need a second wardrobe to play golf, but instead, your shoes should go straight from the driveway to the fairway. That’s why we made our shoes more comfortable, versatile and affordable than other golf shoes. Driveway to fairway – I love it. So before we dive into the story of TOMO Golf, let’s learn a little more about Sunny Chou. What’s your background? I studied economics in my undergrad at BYU and got my MBA at San Diego State University. Professionally, I spent a few years working for an outdoor recreation startup where we built original design bicycles. In addition, I also worked for a market research firm focusing on customer feedback. 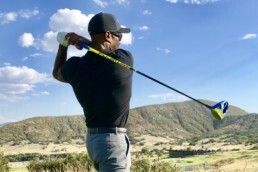 I think those experiences helped me connect the dots that allowed me to create a golf brand that really listens to golfers and offers something they truly want. That’s great! So, what is your background in golf? I’ve always considered myself a hobby golfer. Fairly average in performance but always passionate about the game. I took up the sport in my early college years, and it quickly took over most of my free time! I wish I could say my natural skill or ability on the course led me to where I am today, but it’s more apt to say I’m a regular guy who loves to golf. Because of this fact, I think I can relate to the everyday golfer and what they are after. At the end of the day, I’m driven to make products that I would buy and wear myself as a hobby golfer. Let’s go deeper on TOMO now. What is it that sets your shoe brand apart from your competitors? Before starting TOMO, I remember thinking many times that I wish someone would make a really cool looking shoe that didn’t cost an arm and a leg. Then, when I did shell out the money for an expensive pair of shoes, I’d feel guilty about every scuff, never daring to wear them off the course. I always thought, wouldn’t it be nice if there was a fairly-priced option that wouldn’t sacrifice style? It was this thought that helped me recognize a hole in the market that I could fill with the creation of TOMO. 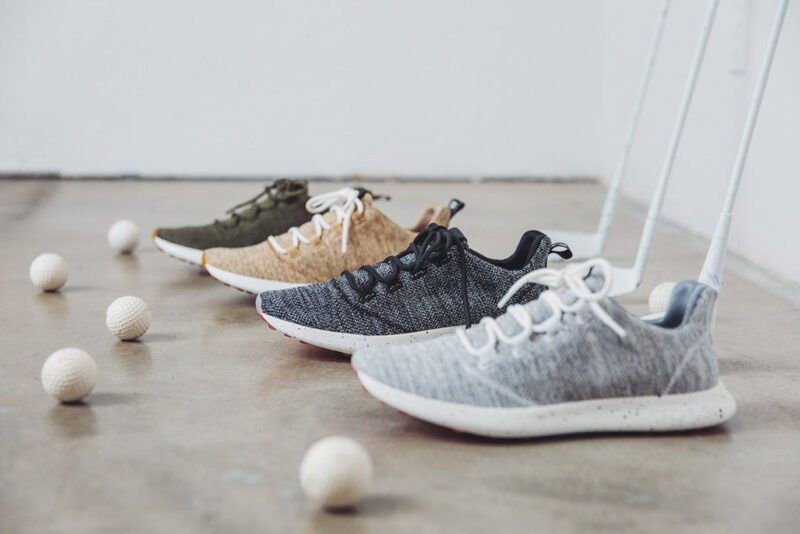 The end result is a golf shoe that serves excellent form and functionality unlike anything else on the market. Try it and you’ll know! So, we did some research… You have some Taiwanese roots. How do they shine through in TOMO? You can see hints of my heritage shining through in the shoes. Minority representation in the game of golf is really – well – a minority. However, golf has gained popularity globally, and we want to reflect the shift toward inclusiveness in our product. That’s why our shoes are truly multicultural with English logos in addition to traditional Chinese characters. On the left shoe, you’ll see the phrase “欣の心田.” This translates to “Hsin’s Field of Heart.” Hsin is my name in my native tongue. In the past, most Taiwanese people made their living as farmers, and the “field” is where they worked. Where they labored. When you put your heart into your field, it means that you put your heart into your work. Into your labor. And it’s something you can be proud of. That’s why I’ve chosen to include this phrase throughout our brand. Just like my family before me, I’m putting my heart into my craft, and my hope is that TOMO users feel that. And we all just learned some Chinese. We notice you maintain a socially responsible focus in producing TOMO shoes. Can you tell us more about that? Our drive to be socially and environmentally responsible really stems from our love for the outdoors and wanting to better the planet. We want to share this beautiful place with many more generations to come. That’s what drives us to source biodegradable, recyclable and earth-conscious materials. As a company, we have a duty to ensure our products are made as responsibly as possible. I think that should be a focus for every business in every industry. We appreciate your thoughtfulness. So, since starting TOMO, what has been your greatest challenge? Designing and developing TOMO Vol. 1 has really been a fun and challenging experience. Our shoes are simple in design, but it certainly hasn’t been simple getting each detail perfected. Finding the right materials. The best production partners. 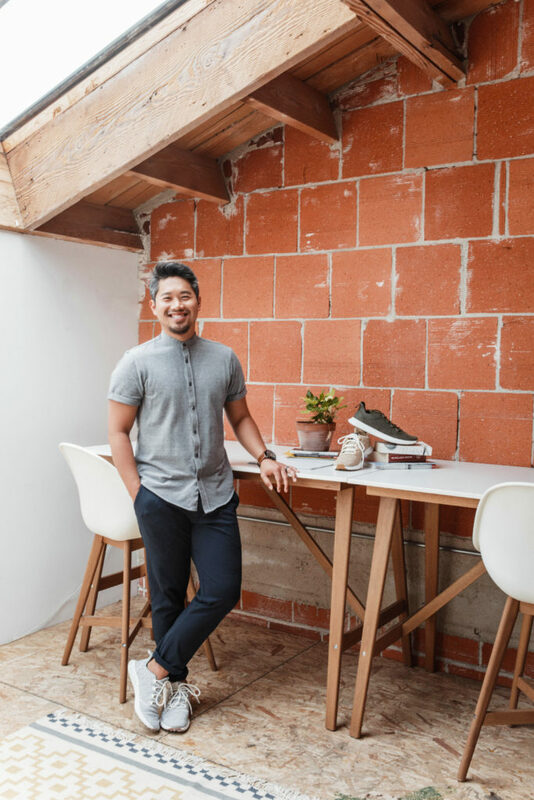 Creating a new shoe from scratch… These things come with a lot of unexpected twists and turns that you can’t really prepare for. Learning to navigate these waters can be challenging, but we are proud of what we’ve created thus far. That said, we’re always growing and trying to improve. Vol. 2 is currently in the works, and we hope that it’lld raw more people into the game! What has been your most rewarding moment since starting TOMO? Tough to choose. It’s funny because the very first iteration of TOMOs were a complete failure. And, I’ll be honest… horrendously ugly! But, I have to say. I’m still super proud of them because they’re something we made from scratch. Many versions later, we’ve landed on the design you see in Vol. 1, and it feels good to know where we came from. Every time a customer messages us or leaves a comment about these being the most comfortable shoes they’ve ever worn, it fuels our fire to keep going and create a unique product for the golf community. What can we look forward to from TOMO in the future? We didn’t know how the industry would receive Vol. 1. So, initially, we only released them in men’s sizes. Fortunately, we’ve had a great amount of interest from our fellow female golfers. So, next spring, we’ll be releasing Vol. 1 in women’s sizing in a few unique colors. We are also working to develop Vol. 2, which will be released Spring of 2019. Keep your eye out! We’re looking forward to it! Let’s wrap this up with a few fun, rapid fire questions. If you could play 18 with anyone, who would it be? Charles Barkley… I have to see that swing in person. Hey, I hear he’s improving… What piece of equipment is an absolute necessity for you to play a round? I feel the right answer would be TOMOs…? But in reality, I’d much rather have a cold drink. Good call. What is your top bucket list course and why? 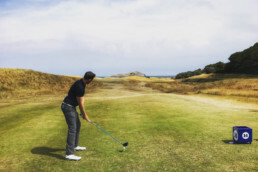 I actually have a Google doc called “places to golf before I die!” The Old Course at St. Andrews is at the top of the list, for obvious reasons. But if not for its history, I’d choose South Africa’s Legend Golf & Safari Resort – Hole 19. Nice choices. Thanks for joining us for A Quick Round, Sunny!